Snap quiz: What do you do when you have leftover crème fraîche you don’t know what to do with? There aren’t as many options as you’d think, at least not until you start doing serious recipe development (ok, how much buttermilk plus butter can you swap out for an ounce of crème fraîche?) so the obvious answer is, “Look at a Joanne Chang cookbook and see if there’s a recipe that calls for the exact amount you have left over (or close enough to it).” You can, of course, use your leftover crème fraîche to make more crème fraîche — perhaps if you’re looking for some homemade butter that would be a good option, so long as you’re sure what you’ve got has the right bacterial cultures in it (and they’re still alive). But Joanne Chang uses crème fraîche a lot, so you can pretty much always find a recipe that combines it with a bunch of pantry ingredients to make something tasty. So it was for me, after making her Midnight Chocolate Cake (which calls for only a small amount of crème fraîche) — despite being already cultured, the stuff still doesn’t keep forever, so I had probably not more than a month to use the rest of it. 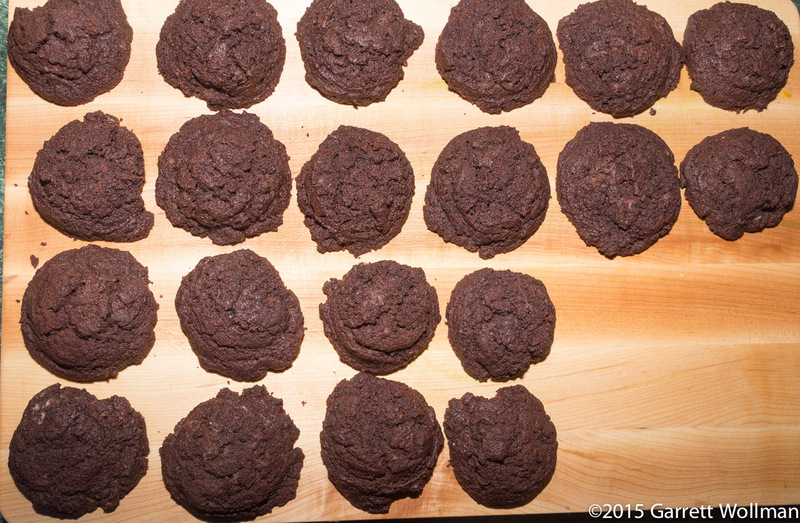 Each whoopie pie will be a sandwich of two cakes and a simple ganache filling, so we start by making the cakes. 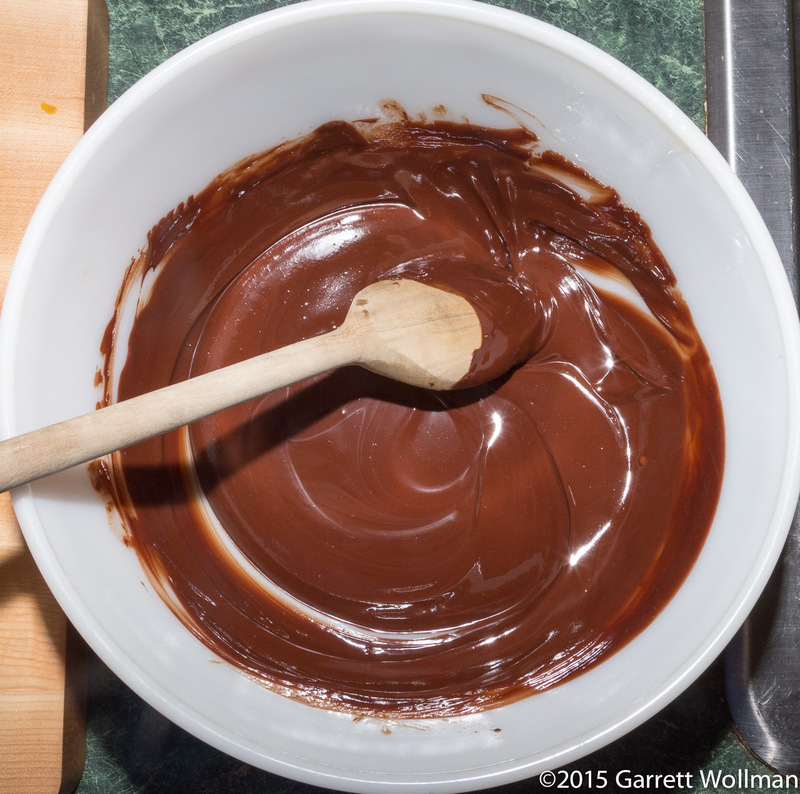 (If you’re in a hurry, you should probably start with the ganache instead — it will need to set for several hours until it’s spreadable, which will take longer than the cakes will need to cool.) The wet ingredients are 85 g of unsalted butter, 120 g of crème fraîche, two large whole eggs, two egg yolks, two teaspoons of vanilla, and 280 g of bittersweet chocolate. 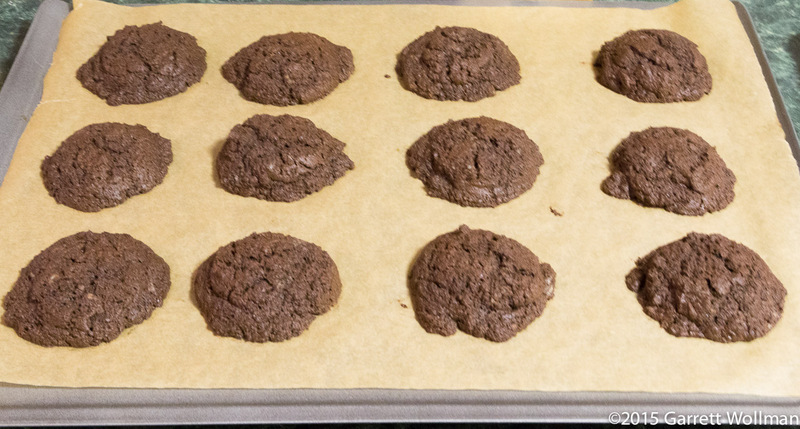 (I used Valrhona Caraïbe 66% “feves”, or baking discs, which have the benefit of not needing to be further chopped before melting.) The dry team consists of 140 g of all-purpose flour, a teaspoon of baking powder, and half a teaspoon each of baking soda (to neutralize the crème fraîche) and kosher salt. After whisking in all the rest of the wet ingredients, the mixture has become somewhat more glossy; this is primarily a result of the egg whites. The dry ingredients are then stirred or folded in using a spoon or a rubber spatula, and the batter must be allowed to sit at room temperature for about half an hour to thicken and cool to room temperature. While it’s thickening, the baking soda and baking powder are also releasing carbon dioxide into the batter, forming bubbles that will determine the final texture of the cakes. 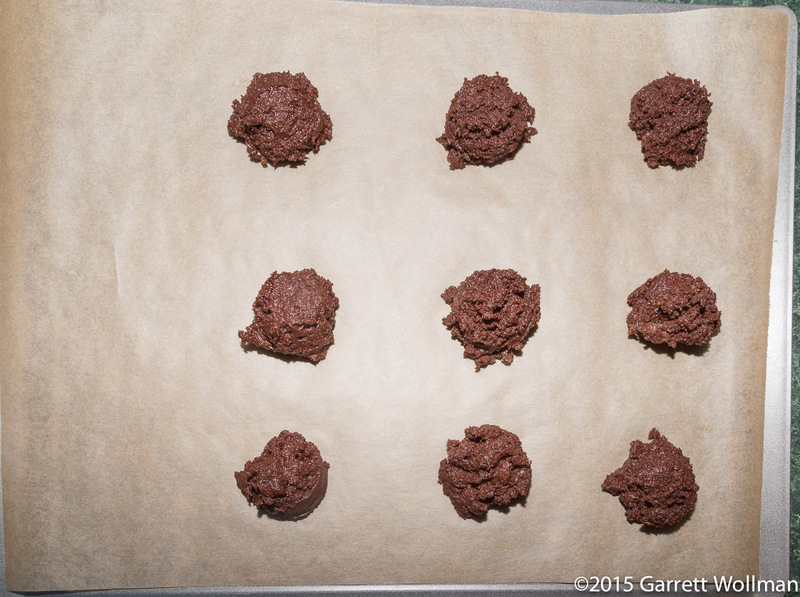 I used a #40 disher to portion out the cakes onto parchment-lined cookie sheets. This gave me 21 cakes in total, which (being an odd number) is one too many — so I ate the extra one. (Chang describes the correct portion as “golf-ball-size”, so I went through all the dishers in my drawer to find the one closest to that size. Dishers are sized by the number of scoops to the quart, so this is 4/5 of a fluid ounce; you can usually find the size stamped or etched on the “sweeper” blade.) They are baked in a 325°F (160°C) oven until “just barely firm when touched in the center”, which for me took 14 minutes. Now it’s time to make the filling, which is a standard ganache made with 170 g of chocolate (I used the slightly stronger Valrhona Guanaja 70% for this one) and 180 g (¾ cup) of heavy cream. The usual procedure applies: scald the cream, pour over the chocolate, let stand for 30–60 seconds, whisk until smooth, then let cool to room temperature or until the desired consistency is reached. In this case, it needs to be spreadable; if the ganache is applied to the cakes before it has firmed up enough, it will ooze out of the middle of the sandwich rather than forming a stable filling. Once both sheets of cakes have cooled fully on a wire rack, it’s time to prepare them for applying the filling. This mostly means sorting them: for the best sandwich effect, you want the filling to stay on the inside, which means finding cakes that are very nearly the same size and shape on the bottom. I arrayed them all on my cutting board and then swapped the mismatches until I was happy with the result. 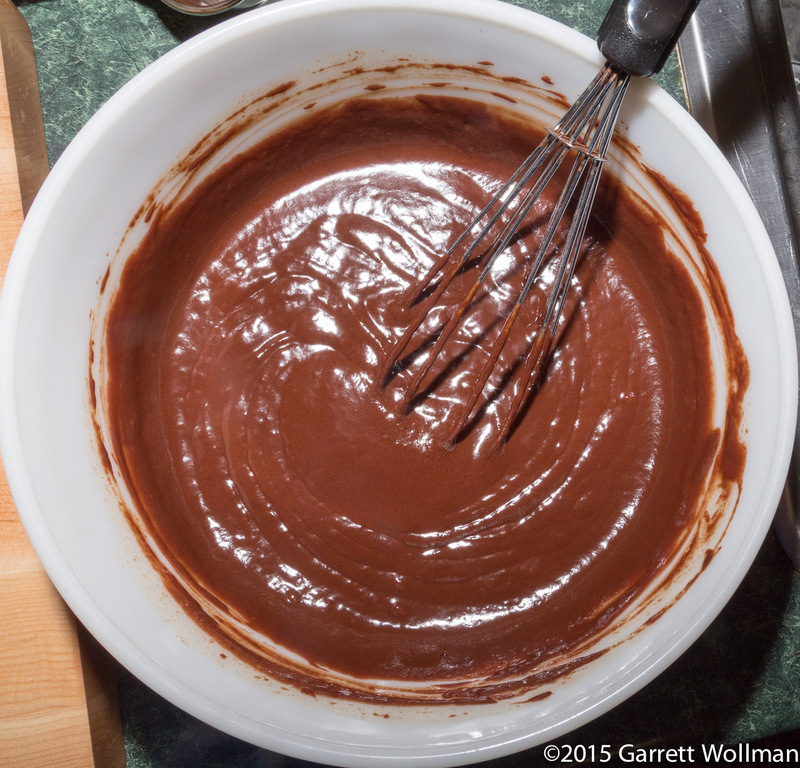 Using an offset spatula, spread the ganache between two cakes and press together to adhere. 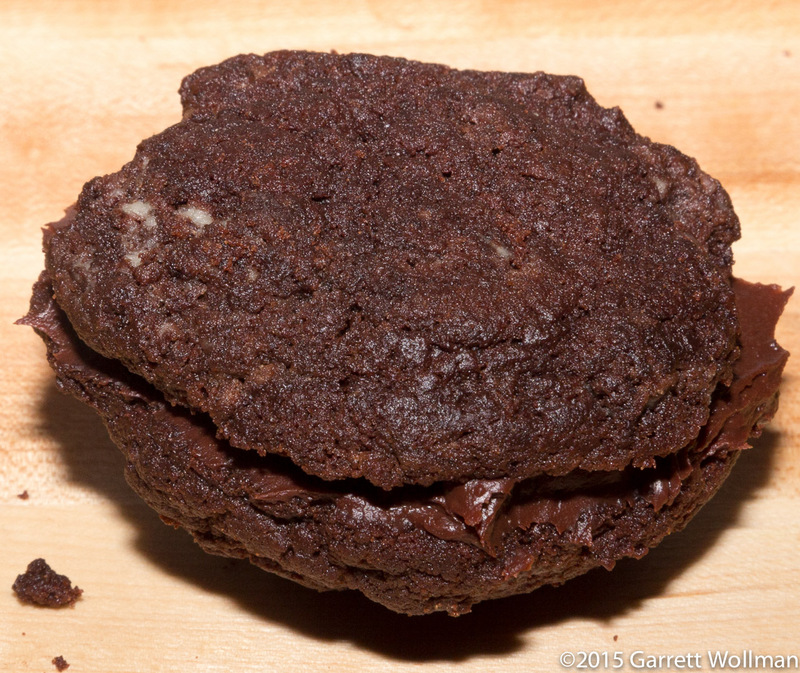 This recipe makes ten whoopie pies, although I had a couple tablespoons of leftover ganache (<burp>) to go along with my one extra cake. The result says more “sandwich cookie” to me than what I’m used to in a whoopie pie: commercial bakery whoopie pies (which seem to all be pumpkin-flavored this time of year) are more muffiny in texture, and the cakes are moist and sticky on the outside while still being crumbly and friable when you bite into them. These, on the other hand, are much drier, both outside and in, and more tender, but have a far richer filling than the usual hyper-sweet frosting than is usual for a bakery whoopie pie. So I’d say there are upsides and downsides to Chang’s version here. I wouldn’t mind doing a side-by-side with her “Oreo” sandwich cookies (how has she not gotten sued by Mondelez yet? ), which aren’t anything like the real Oreos in anything but color, but share a lot of textural similarities with these whoopie pies. As I’m writing this on a Saturday, I haven’t had a chance to share these with my coworkers — that will take at least until Tuesday, which is well before my self-imposed deadline for publishing this post. Based on using Valrhona Caraïbe 66% for the cakes and Valrhona Guanaja 70% for the ganache filling. This entry was posted in Food and tagged chocolate, Joanne Chang, recipe. Bookmark the permalink.